The revolt of Moab-Sickness of Ahaziah, king of Israel. 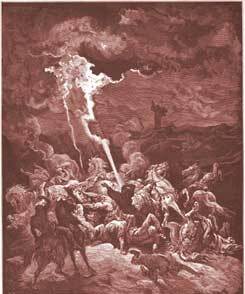 (1-8) Fire called from heaven by Elijah-Death of Ahaziah. (9-18)1-8 When Ahaziah rebelled against the Lord, Moab revolted from him. Sin weakens and impoverishes us. Man's revolt from God is often punished by the rebellion of those who owe subjection to him. Ahaziah fell through a lattice, or railing. Wherever we go, there is but a step between us and death. A man's house is his castle, but not to secure him against God's judgments. The whole creation, which groans under the burden of man's sin, will, at length, sink and break under the weight like this lattice. He is never safe that has God for his enemy. Those that will not inquire of the word of God for their comfort, shall hear it to their terror, whether they will or no. 9-18 Elijah called for fire from heaven, to consume the haughty, daring sinners; not to secure himself, but to prove his mission, and to reveal the wrath of God from heaven, against the ungodliness and unrighteousness of men. Elijah did this by a Divine impulse, yet our Saviour would not allow the disciples to do the like, #Lu 9:54|. The dispensation of the Spirit and of grace by no means allowed it. Elijah was concerned for God's glory, those for their own reputation. The Lord judges men's practices by their principles, and his judgment is according to truth. The third captain humbled himself, and cast himself upon the mercy of God and Elijah. There is nothing to be got by contending with God; and those are wise for themselves, who learn submission from the fatal end of obstinacy in others. The courage of faith has often struck terror into the heart of the proudest sinner. So thunderstruck is Ahaziah with the prophet's words, that neither he, nor any about him, offer him violence. Who can harm those whom God shelters? Many who think to prosper in sin, are called hence like Ahaziah, when they do not expect it. All warns us to seek the Lord while he may be found. God is and always will be! No other God before me! I am that I am!!!! PRAISE THE LORD GOD! We must put our trust in THE LORD at all time and we must declare HIM to the world and all of the devils in it and in he'll. MESSIAH KING JESUS CHRIST IS LORD GOD! YHVH! THE LORD IS SOON TO RETURN. THE DAY OF THE LORD IS AT HAND. The mark of the beast is taking place. The law is the world "national id act 2005" it is an international law "all must scan hands for id and life. I had read this story before, and I wanted to read it again, I couldn't find it, So I asked the Author of this book to show me where the story was, and he did !! But the meat of the story to me is -- No matter what the situation is-- you seek God the FATHER ABOUT IT FIRST !! Comment*you cannot call on whom you do not know and equally seek whom you cannot find. it is an error to thing otherwise, king ahaziah knew no God but gods. it is a great lesson for today christian to be rour, The Book James 4:7 Resist the Devil and he shall free away from you, until you teach your enemy the greated lesson, before he will stop attacking you. The captain of the 3rd fifty acknowledged God in Elijah and humbled himself before Him and he was spared with his fifty.Anybody that acknowledges God will be honored accordingly. innocent or guilty with him. Elijah didn't run away nor hide himself. What Do You Think of 2 Kings 1? Shortly after the death of Ahab, who rebelled against Israel?